We’re proud to announce that we are partnering with Misnomer Dance Theater to stream their performance live from the Joyce Soho. The performance and live stream will happen tonight (Friday) at 7:30pm. You can catch the action on the LiveStream channel or watch the embedded video below. Please join us tonight for this very special event. We’ll be streaming this dance performance live on the web and feature a live webchat. Last night, a group of bloggers, producers, artists, choreographers, and critics gathered to discuss a very important question – in a shifting world where the role of print media is shifting, what is the role of the critic (particularly in the world of dance)? In the arts, press = $. If you get good press, you get more bookings (from presenters), more donations (from patrons and board members), and more people come see you. So the (basic) formula goes. So, Press is important. Duh. But press does not equal critics. And critics do not exist for the sole purpose of generating good press for art. Critics write to generate dialogue. Is this still the case? More importantly, will that be the case 2 years from now? Probably. It should. But can bloggers actually fulfill the same role that the critics from the New York Times (and other reputable publications) have filled for the past X amount of years? And what were those roles to begin with? You’re welcome to debate these questions in the comments. But for the purpose of this particular post, I’ll focus on the role of bloggers, and what I see as an evolution of publicity, audience development, and general discourse around art work. To grossly generalize and simplify things, I’ll break it down into 2 camps. Bloggers are bad, and bloggers are good. Many writers have lost their jobs as critics for reputable publications. If writers who have been laid were to publish on a blog, would their word be valued any less? If Elizabeth Zimmer published a critique or piece on her own blog, is her writing any less valid? I trust we live in a world where this is not the case. So why are we not seeing more writers who have been laid off blog on their own sites? We still believe in mainstream media. Mainstream media still serves a purpose. For those interested in Arts + Technology, I’ll be webcasting The A.W.A.R.D. Show from the Joyce Soho [via UStream] tonight @ 7pm EST, with Nic Petry on Camera. The winner of the A.W.A.R.D Show will win $10,000 to develop new dance work. If you can’t make it tonight, you can also catch past performances of the A.W.A.R.D. Show on the UStream Archives. Also, make sure to tune in June 21st to see who will take home the $10k prize. THE WINNER of The A.W.A.R.D. Show! 2009: New York City will be announced directly following the final performance on Sunday, June 21. Why is “dance made for the web” an important topic? As audiences for dance grow through the web and stage, so does the opportunity to create and share work. Some it is completely choreographed, others are more improvisational. I’ve compiled a few videos that give us a peek into the present + future (or death) of dance, art, technology, and the surrounding community dialogue on the web. Please feel free to add links to videos you’ve seen in the comments section. Also – for a nice overview of videos focused on Ballet, take a look at Doug Fox’s post. We’ve launched Daniel Gwirtzman’s site! 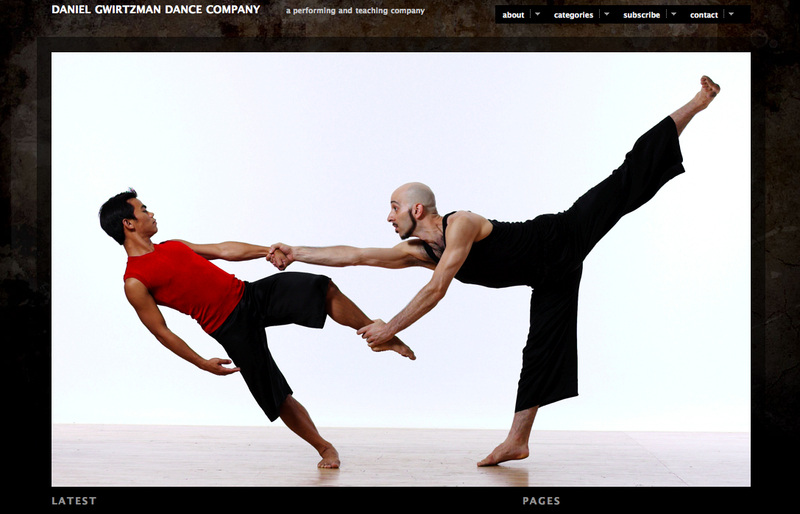 I’m happy to say we’ve officially launched Daniel Gwirtzman Dance Company’s new site! 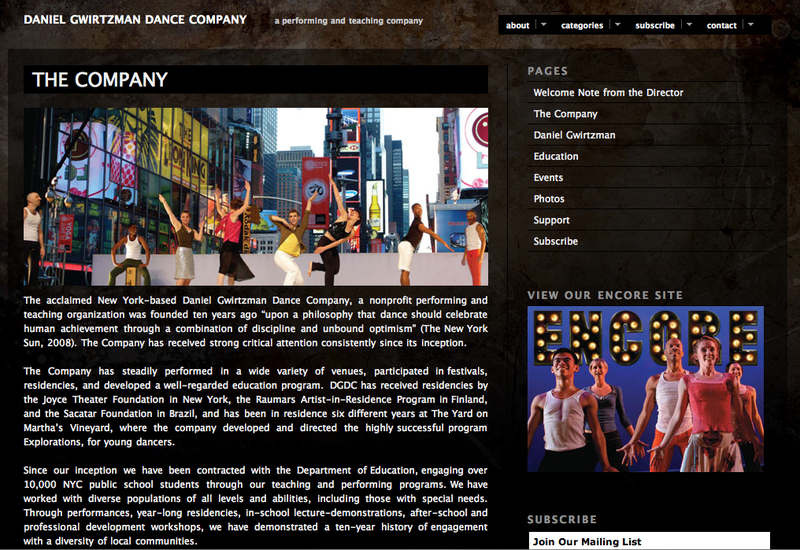 Actually, I’m quite impressed with the final product we put together for the Daniel Gwirtzman Dance Company. With the help of great media all around, we were able to piece together a photo gallery, a video gallery, a new subscription system, and even an SMS delivery system for his audiences. It’s really been great working with Daniel and his company. They really did a phenomenal job in gathering their assets, organizing their content, and creating compelling videos. Congratulations, Daniel! It’s exciting to know I’ll be able to continue to help you communicate your wonderful work! If you like this, take a look at my other work. I initially setup this wordpress site in a subdirectory ( /wordpress ) so that I could develop things without affecting their active site. After the wordpress site was all setup, I needed to make the switch. The article above did the trick for me. I’d love to hear your thoughts – share your ideas and leave a comment! Tonight, the Martha Graham Dance Company previewed their work Clytemnestra at NYU’s Skirball Center. The show featuredÂ Fang-Yi Sheu in the title role, along with a phenomenal cast. I had the personal honor of creating the supertitles for the production. Most helpful to the audience is the addition of a few discreet surtitles to describe the action. At one point they offered a bit of unintentional comic relief, when the text read, “The women of Mycenae celebrate the victory over Troy,” and the women onstage grimaced, clawed the air and appeared to be in the grip of abdominal distress. But they know what we’ve forgotten: There is no conquering death. Tragedies don’t disappear; their ghosts catch up to you, sooner or later. Janet Eilber, artistic director for the Martha Graham Dance Company, had the task of devising the text. Once she delivered the full text, I created the system to project them above the stage. Typically, operas feature supertitles to help audiences understand what the performers are saying. The supertitles, in this instance, offered the audiences a chance to catch up with the narrative of the piece. The site features a full content management system (run on Drupal), a full media player managed through brightcove, and some nice graphic work provided by her colleagues. Check out the customized media player here. During the process, we spent great care taking a look at the works page. We wanted to make sure we could feature individual photos, videos, and text – all in one area – so the content management system had to be flexible enough to handle all those elements. During the process, we also setup a facebook page, a blip.tv page, as well as a pro flickr account. The goal of setting up all these sites were simply to allow Jody to extend her reach beyond her site, while still providing a homebase for her work, and image. In addition to visiting the new site, make sure you check out Ghosts, premiering in October! The video above is Lamentation by Martha Graham, shot at Saratoga Performing Arts Center during a live performance. It was a 2 camera shoot, taped and edited entirely for the web. NOTE : This is a ROUGH VERSION, not the final version. This is intended as a preview. I created this video in order to generate interest around The Clytemnestra Project. It features choreography from Panorama by Martha Graham. The students in the piece learned the choreography in 1 week! I’ve been spending the first part of my Summer with the Martha Graham Dance Company. We’re on a residency at Skidmore. I’ve had the privilege of working with phenomenal dancers from the company, and am also working with a team of over 30 students to produce a group blog. The video below was shot and edited in one day, and features original choreography from all the students. Dancing in the Fields from Jaki Levy on Vimeo. As part of Misnomer Dance’s residency at Skirball, I put together these two videos to help promote their show, Future Perfect. Within 48 hours, we had over 2,000 views. The show sold out an 800 seat theater on the 2nd night. For a full catalog of videos, visit this page.